An exhibition of recent work by Raúl Díaz (1952¿) was on display in Dallas, Texas, at the Pan American Art Gallery between June 10 and July 16, 2005. A native of Córdoba, Argentina, Díaz showed a precocious talent for drawing, which was nurtured and encouraged by his parents who sent him to study drawing and painting with a private teacher. At the age of twenty, he enrolled for two years in the School of Engineering and studied painting with the Italian artist Cristiano Czerni. Those two years plus one in the School of Architecture became the formal preparation that, paired with his later work in construction and decoration, shaped his future art, which is crafted as much as it is painted. In 1987, Díaz held his first solo show in Argentina at the Galería de Arte Giaroli in Córdoba. Ten years later, Jerald Melberg, the director of the gallery by the same name in Charlotte, North Carolina, discovered Díaz¿s work at Art Miami and became indelibly impressed by ¿its mystery and beauty.¿ The same year, he gave Díaz his first individual exhibition outside of Argentina. The current show was also exhibited at Melberg¿s gallery. Since then, Díaz¿s art has been exhibited in numerous exhibitions around the world, as his reputation continues to grow. Around 1985, Díaz¿s work attained the maturity out of which it has continued to evolve. One can observe influences that affected him, not only because of their iconography, but also because of their emotional content. Díaz¿s romanticism drew him to the melancholy in the work of Picasso¿s early years in Paris. The acrobats of the Pink Period served as point of departure on the theme of the circus: horses, harlequins, acrobats, and trapeze artists, painted primarily in washed-out blues. In addition, he was inspired by several versions of Cezanne¿s card players sitting at a table, also painted in shades of blue. These compositions addressed subtle harmonies and disharmonies among the persons within. Another theme that continues to fascinate Díaz is the person in repose or perhaps asleep at a table, as in certain portraits by Picasso during the thirties of Marie Thérese Walter and Dora Maar. Díaz uses this theme to address self-containment. Studying his work in this exhibition, one concludes that for Díaz each moment is a timeless experience to be lived, treasured, and transformed into art. The same oceanic feeling that invades him when he makes a painting overrides the viewer as s/he walks through the gallery, swept away by the beauty of each work. Díaz is most comfortable when he is most vulnerable; and this unselfconscious comfort draws the viewer into a world so precious, a world so subtle, that its discovery generates a form of reverence. Díaz refers to the mystery of life in a painting that one cannot help but associate with David Caspar Friederich¿s Wanderer Above the Sea of Fog. Standing on the ledge of a window, a small man, a humble spectator in awe, leans forward to gain a better view of the distant sea. Diaz¿s work is consistently strong, but the paintings in the show that pull like magnets refer to his worship of woman. Quiet and surprisingly intimate, each work speaks of a private devotion. Díaz is a man in love. He makes spectators privy to his most intimate moments in visual poems about his adoration for the wellspring that satiates his emotional thirst. Asserting that only love transcends time, lovers inhabit a cocoon of silent tenderness. Díaz paints couples making love in the most alluring ways, over and over. 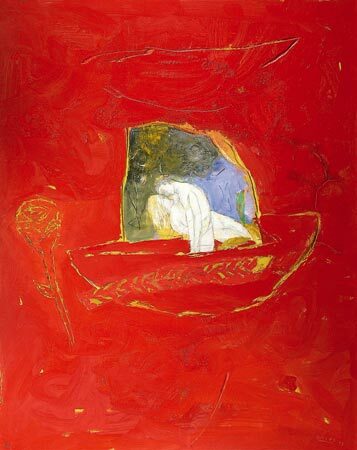 One work, to which I kept returning, is of lovers cradled on a boat floating in a sea of red; an opening, like a small window on the space behind them, frames their silhouette with a landscape of green foliage beneath a blue sky. The man, with eyes closed, leans slightly forward to kiss the woman¿s virtually weightless body, rising toward his embrace. Another riveting work outlines two profiled heads, facing each other. The man is about to kiss away the tear spilling from the woman¿s eye. Díaz¿s paintings are wooden panels made to look like ancient walls, doors, or shutters worn by time, on which the graffiti, left by a passerby, has outlived the object on which it was made. Díaz is an extraordinary painter who, having arrived at the realm of the sublime, promptly moved in. It is my hope that he will stay there. A fully illustrated 224-page hardcover book, exquisitely printed in Italy, was available for sale at the gallery. Several sections follow the introduction by Jerald Melberg. One gathers a number of past reviews of Díaz¿s work from 1991 to 1999, another is a statement by the artist, one essay places his work within the context of Argentina¿s contemporary art, two address the symbolism in Díaz¿s work, and there are also a lengthy illustrated biography and a list of exhibitions. The book is illustrated throughout with reproductions of paintings and works on paper produced between 1990 and 2001.